There are few things more intimidating to cooks than creating a fancy French menu to serve to guests. French cuisine is the pinnacle of gourmet cooking for some people; create a menu that will wow your guests with a complexity of flavor, while not overwhelming you in the kitchen. Planning a menu in advance allows you to accomplish a few things at once; it gives you the chance to pull together your ingredients, coordinate your choices and coordinate your cooking efforts. Some dishes can be made ahead of time and left to cook slowly, while others need to be produced at the last minute. As you put together your menu, keep in mind how long each dish needs to cook and how much preparation is required. Presentation is everything in fancy meals, so leave yourself plenty of time to put the final touches on each plate. Soup can be hot or cold and should set the tone for the rest of the meal. Start heavier, beef-based menus with a hot, oven baked French Onion Soup. For summer menus, try making a cold soup such as vichyssoise. Heat the butter in the bottom of a large stock pot. Add the leeks and cook until soft. Add the potatoes, milk, salt and pepper; cook over medium heat until the potatoes are soft. Pour into a food processor and pulse until smooth; return to the stove. Add the cream and slowly heat through. Remove from heat and chill until just prior to serving. Garnish with freshly chopped chives. Following the soup, give your guests a short break before the entrée with a cheese course. Baked brie served with fresh bread is a warm and savory option, or present a mix of cheeses with some fruit. Add grapes and freshly sliced apples to the cheese and bread to offer a sweet balance to stronger cheeses. The main course of the meal should be peak of the dining experience. Use the highest quality ingredients you can find to allow the flavors to take center state. 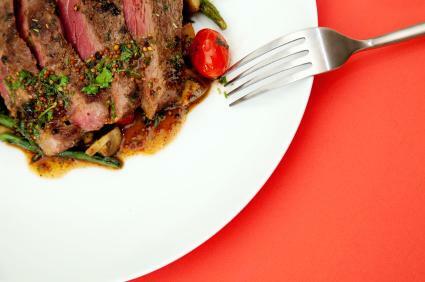 Consider a simple, but fancy meal such as steak au poivre with a side of fresh asparagus. Use filet mignon and a blend of peppercorns to create an entrée that leaves your guests satisfied. Heat the oil in a sauté pan until it just begins to smoke. Sear each side of the steak, and reduce the heat until the steaks are cooked to your liking. Remove the steaks from the heat, and coat each side with a mixture of the three peppercorns. Set the steaks aside, and add the shallots to the pan; sauté until soft. Pour the beef stock and crème fraiche into the pan, and deglaze as you stir. Boil the sauce down until it thickens - about four to five minutes. Pour the sauce over the steaks, and serve immediately with oven roasted asparagus on the side. Give your guests a few minutes after dinner with some strong coffee before serving dessert. Finish off the meal with sweet crêpes or a crème caramel. Heat five ounces of sugar and the water in a saucepan over high heat to make the caramel. Stir until the sugar turns yellow/brown in color. Pour the caramel into the bottom of four, oven safe-bowls and swirl quickly to coat the sides. Split the vanilla bean into thirds, lengthwise. Heat the milk and vanilla bean on the stove until just before boiling. Beat the eggs until foamy and pour the hot milk into them, stirring well. Remove the vanilla bean pod from the milk mixture, and pour the milk mixture into the four bowls. Pour a half-inch of water into a large baking tray, and set the bowls in the water. Good food should be savored and enjoyed. Don't rush through your cooking, your presentation or your enjoyment of the food with your guests. Let your guests mingle and the foods settle between courses to give you time to pull together the best presentation for the next course. Fancy foods cannot be rushed; take your time and enjoy each moment.